Kenneth Ma (馬國明) and Niki Chow (周麗淇) recently filmed a tear-jerking scene for their upcoming drama The Misadventure of Zoo <流氓皇帝>. Although they make a convincing couple on-screen, Niki confessed that Kenneth does not attract her in real life and is not worried at all about potential romantic gossips. The Misadventure Of Zoo is a remake of TVB’s 1981 production starring Adam Cheng (鄭少秋) and Louise Lee (李司棋). Kenneth takes on Adam’s role as a villager who comes into wealth and by chance becomes an emperor. Niki plays his lover, whom he later abandons to follow riches and fame. After a series of events Kenneth returns to his home as a beggar but finally reunites with his former lover. 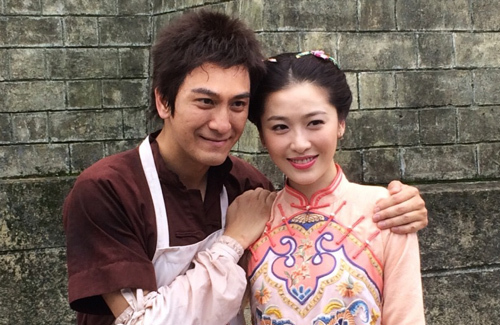 Kenneth and Niki shot the tearful reunion scene recently. Kenneth was under attack by military forces but he bravely tried to save those around him. As heroic as he was, the gunfire unfortunately hit him in the buttocks, injuring him. Lying low to escape the flying bullets of war, he finally found Niki and the two slowly crawedl towards each other, calling out hoarsely with arms outstretched. Kenneth seemed concerned about Niki’s statement, quickly reassuring everyone that he is desperate to date, though would like to take the opportunity to build his career while he can. A heavily promoted artiste at TVB, Kenneth has been given a packed schedule this year full of filming opportunities. After filming wraps in June, he will take a short break to perform overseas before returning to the set once again to star in The Hero <梟雄> alongside heavyweights Wayne Lai (黎耀祥) and Anthony Wong (黃秋生). I just feel that Niki is still carrying a torch for Kevin. I may be wrong.